Double Fine joins the list of entities interested in THQ's assets, though possibly for different reasons. THQ's ongoing bankruptcy proceedings have a new interested party: Tim Schafer's Double Fine, which has requested copies of the THQ bankruptcy filings. The reason for this request is, as yet, unknown. The news comes courtesy of Distressed Debt Investing, which went on to Tweet the full bidding procedures for the January 22nd auction. When measured against the likes of Warner Brothers, Double Fine seems an unlikely buyer, but it may have an interest in some of THQ's properties. Double Fine partnered up with THQ, back in the day, on Costume Quest and Stacking; it may be interested in the eventual fate of those games, assuming THQ still has a hand in them. For that matter there may be other THQ titles that Double Fine would be interested in picking up. When the auction was delayed earlier this month, Distressed Debt said that part of the reason was to give interested parties more time to get involved. 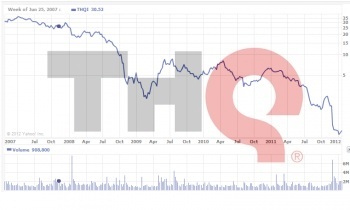 It also allowed THQ to be sold off bit by bit. Double Fine is only one of the parties to express an interest; there are at least ten others at the table.